1867 – Maximilian I executed by Liberal republicans. The House of Lorraine (German: Haus Lothringen) originated as a cadet branch of the House of Metz. It inherited the Duchy of Lorraine in 1473 after the death of duke Nicholas I without a male heir. By the marriage of Francis of Lorraine to Maria Theresa in 1736, and with the success in the ensuing War of the Austrian Succession, the House of Lorraine was joined to the House of Habsburg, and was now known as Habsburg-Lorraine (German: Habsburg-Lothringen). Francis, his sons Joseph II and Leopold II, and grandson Francis II were the last four Holy Roman Emperors from 1745 to the dissolution of the empire in 1806. 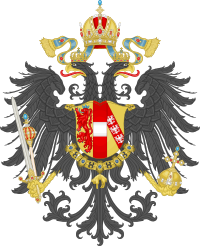 Habsburg-Lorraine inherited the Habsburg Empire, ruling the Austrian Empire and Austria-Hungary until the dissolution of the monarchy in 1918. Although its senior agnates are the Dukes of Hohenberg, the house is currently headed by Karl Habsburg-Lothringen (born 1961), oldest grandson of the last emperor Charles I. The house claims descent from Gerard I of Paris (Count of Paris) (died 779) whose immediate descendants are known as the Girardides. The Matfridings of the 10th century are thought to have been a branch of the family; at the turn of the 10th century they were Counts of Metz and ruled a set of lordships in Alsace and Lorraine. The Renaissance dukes of Lorraine tended to arrogate to themselves claims to Carolingian ancestry, as illustrated by Alexandre Dumas, père in the novel La Dame de Monsoreau (1846); in fact, so little documentation survives on the early generations that the reconstruction of a family tree for progenitors of the House of Alsace involves a good deal of guesswork. What is more securely demonstrated is that in 1048 Emperor Henry III gave the Duchy of Upper Lorraine first to Adalbert of Metz and then to his brother Gerard whose successors (collectively known as the House of Alsace or the House of Châtenois) retained the duchy until the death of Charles the Bold in 1431. After a brief interlude of 1453–1473, when the duchy passed in right of Charles's daughter to her husband John of Calabria, a Capetian, Lorraine reverted to the House of Vaudemont, a junior branch of House of Lorraine, in the person of René II who later added to his titles that of Duke of Bar. The French Wars of Religion saw the rise of a junior branch of the Lorraine family, the House of Guise, which became a dominant force in French politics and, during the later years of Henri III's reign, was on the verge of succeeding to the throne of France. Mary of Guise, mother of Mary, Queen of Scots, also came from this family. Under the Bourbon monarchy the remaining branch of the House of Guise, headed by the duc d'Elbeuf, remained part of the highest ranks of French aristocracy, while the senior branch of the House of Vaudemont continued to rule the independent duchies of Lorraine and Bar. Louis XIV's imperialist ambitions (which involved the occupation of Lorraine in 1669–97) forced the dukes into a permanent alliance with his archenemies, the Holy Roman Emperors from the House of Habsburg. The coat of arms of the House of Habsburg-Lorraine. The shield displays the marshaled arms of the Habsburg, Babenberg and Lorraine families. After neither Emperor Joseph I nor Emperor Charles VI produced a son and heir, the Pragmatic Sanction of 1713 left the throne to the latter's yet unborn daughter, Maria Theresa. In 1736 Emperor Charles arranged her marriage to Francis of Lorraine who agreed to exchange his hereditary lands for the Grand Duchy of Tuscany (as well as Duchy of Teschen from the Emperor). At Charles's death in 1740 the Habsburg holdings passed to Maria Theresa and Francis, who was later elected (in 1745) Holy Roman Emperor as Francis I. The Habsburg-Lorraine nuptials and dynastic union precipitated, and survived, the War of the Austrian Succession. Francis and Maria Theresa's daughters Marie Antoinette and Maria Carolina became Queens of France and Naples-Sicily, respectively; while their sons Joseph II and Leopold II succeeded to the imperial title. Apart from the core Habsburg dominions, including the triple crowns of Austria, Hungary, and Bohemia, several junior branches of the House of Habsburg-Lorraine reigned in the Italian duchies of Tuscany (until 1860), Parma (until 1847) and Modena (until 1859). Another member of the house, Archduke Maximilian of Austria, was Emperor of Mexico (1863–67). In 1900, Archduke Franz Ferdinand of Austria (then heir presumptive to the Austro-Hungarian throne) contracted a morganatic marriage with Countess Sophie Chotek. Their descendants, known as the House of Hohenberg, have been excluded from succession to the Austro-Hungarian crown, but not that of Lorraine, where morganatic marriage has never been outlawed. Nevertheless, Otto von Habsburg, the eldest grandson of Franz Ferdinand's younger brother, was universally regarded as the head of the house until his death in 2011. It was at Nancy, the former capital of the House of Vaudemont, that the former crown prince married Princess Regina of Saxe-Meiningen in 1951. The following is a list of ruling heads (after 1918 pretenders) of the house of Ardennes-Metz and its successor houses of Lorraine and Habsburg-Lorraine, from the start of securely documented genealogical history in the 11th century. Charles II died without male heir, the duchy passing to Isabella, Duchess of Lorraine, consort of Naples by marriage to Duke René of Anjou. The duchy passed to their son John II (r. 1453–1470), whose son Nicholas I (r. 1470–1473) died without male heir. The title now went to Nicholas' aunt (sister of John II) Yolande. The House of Lorraine was formed by Yolande's marriage to René, Count of Vaudémont (1451–1508), who was descended from John I (Yolande's great-grandfather) via his younger son Frederick I, Count of Vaudémont (1346–1390), Antoine, Count of Vaudémont (c. 1395–1431) and Frederick II, Count of Vaudémont (1417–1470). René inherited the title of Duke of Lorraine upon his marriage in 1473. The heir of Franz Joseph, Rudolf, Crown Prince of Austria, committed suicide in 1889. Franz Joseph was succeeded by his grandnephew, Charles I, son of Archduke Otto Francis, the son of Archduke Karl Ludwig, a younger brother of Franz Joseph. ^ a b Gordon Brook-Shepherd. Uncrowned Emperor: the Life and Times of Otto von Habsburg. Continuum International Publishing Group, 2003. ISBN 1-85285-439-1. Pages XI, 179, 216. Wikimedia Commons has media related to House of Lorraine.